here are my latest finds from the local thrift stores. my MIL gifted this beautiful vintage hat to me, found for $11.50. 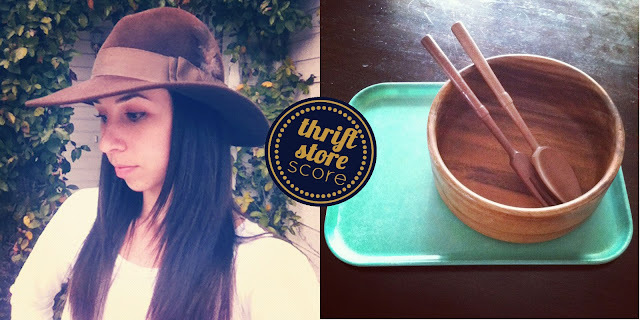 i snagged the bowl for $3.50 and salad servers for $1.50!! i'm pretty excited about this purchase because i've been using Party City salad servers and a mixing bowl for several years. i am officially a grown up and will be proud to bring my salad to bible study tonight. ha! the lunch trays were found a couple weeks ago when i had a rendezvous with my dear friend Cherish at Salvation Army. 3 trays for $2.10. not bad. they are currently spread around my living room with various plants on top. have you found any sweet scores lately? where do you like to go? i''d love to hear about it.